Spiralbound book keeps permanent record of cash disbursements. Space for date, amount, approval, account, and number. Six writing lines to state purpose of petty cash. Note: A minimum quantity of 35 must be ordered, and in units of 5 thereafter. 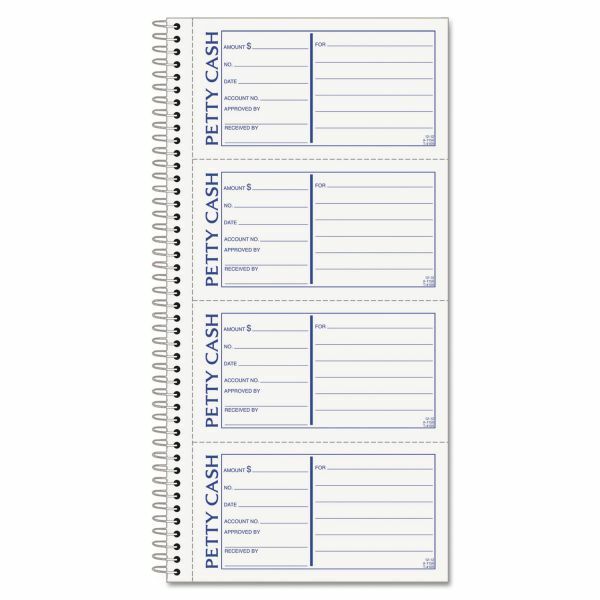 TOPS Petty Cash Receipt Book, 5 1/2 x 11, Two-Part Carbonless, 200 Sets/Book - Petty Cash Book is designed for cash payouts. Use part one for receipt or attach to voucher check; part two remains bound in book. Forms are printed in blue and red ink on white and canary and have a black image and carbonless paper for automatic sets. Wirebound book opens perfectly flat.